I binge-watch Netflix all the time. I get obssessed with a show and quicky find myself on a “play next episode” clickathon. My newest addiction is House of Cards, the groundbreaking original series on Netflix streaming. 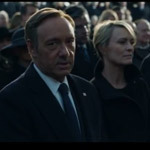 The show follows power-drunk Congressman Francis “Frank” Underwood (played by Kevin Spacey) as he plots to advance his career by seeking revenge against the politicians who betrayed him. In the murky political backwaters of Capitol Hill, where no one shows their hand, the right suit becomes armor and the right dress, smoke and mirrors. 2.) When It Comes to Ties— The Bigger The Knot, The Better. Frank’s tie knots are directly proportional to his rise in power. As his influence grows, his knots get fatter and fatter. They say he’s not someone you can easily push around. 3.) Wear Vera Wang. “We Southern girls clean up nice when we get out of our Daisy Dukes and into our Vera Wang,” says Secretary of State Catherine Durant to Underwood at a fundraiser. She’s a willing participant in Frank’s plot and is dressing the part. 4.) Wash Your Hair And Flaunt Your Assets. Zoe Barnes (Kate Mara) is a fiercely ambitious fresh-out-of-J School reporter at a prestigous Washington newspaper. When she got a shot at hob-nobbing with D.C.’s political elite at a benefit, she washed her perpetually greasy hair and swapped her military jacket and Chucks for a bod-con dress and high heels. She got Frank’s attention, and later leverages it for insider information and advances her own career. 5.) Wear Fitted Button Downs and Eyeglasses. Frank’s wife Claire Underwood (Robin Wright) has a wardrobe to die for— she’s always so put together. She’s worn a number of fitted but structured dresses that have turned heads. She tends to stick with a classic neutral palette of navy, white, or charcoal. But she really exudes authority, and still retains her femininity, in a pale blue fitted button down and tortoise shell glasses. That cropped ‘do is pretty stunning on her, too.